Made of strong zinc alloy, this sturdy screwpull wine opener with its incredible design, is easy to use. Simply allow the handles to grip the neck of the bottle, hold with one hand while your other hand simply pulls the lever up and over the bottle. This action pushes the corkscrew (or worm) into the cork so when you pull the level back over the top of the bottle, the cork is removed...et voila! Now it's time to decant your wine of choice and enjoy! 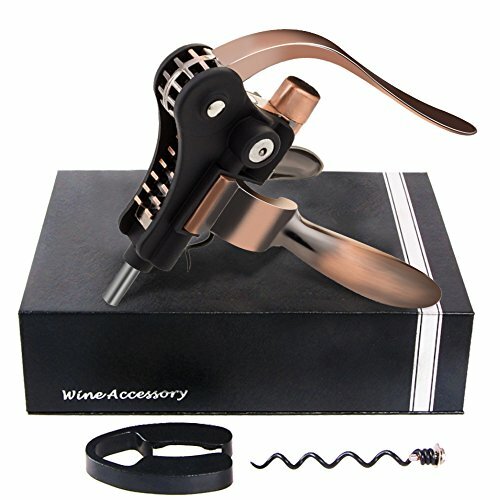 1.Large wine opener copper which opens both natural & synthetic corks, any size of wine or champagne. 2.Sharp and safe foil cutter. No need to use knives and harming your fingers! Let the cutter does the work instead of you! 3.Due to elegant cork opener stand it is very convenient to store the wine tool in your kitchen or bar. 4.Premium wine bottle stopper which can keep your wine fresh for 14 days. 5.Wine bottle opener kit: wine tools are safety packed in our stylish box ,every object is in its place. No worries about scratching! RABBIT WINE OPENER - This Rabbit wine opener removes the cork in seconds with simple motions. Don't struggle with the removal of delicate or stubborn corks anymore. WINE ACCESSORIES SET - Ready to release a bouquet of incredible, rich aromas. Pulling the plug, and driving it out of the bottle, strong, yet graceful, the flavors of the wine come dancing out. WINE TOOL KIT - Any connoisseur will be delighted to receive - beautiful to look at, this clever little gadget is sure to be a firm favorite at the dinner table, a party, or beside the fire side. CORKSCREW - Using only top quality materials, our Wine Opener is made from attractive zinc alloy for the optimum in stylish, dependable performance - time and time again. And with the bonus of our foil cutter, opening wine infront of your guests will be completely hassle-free. IDEAL Wine Opener GIFT - What better way to SURPRISE your loved ones than by offering them the key to the select world of wine? Mother's Day, Christmas, even Valentine's Day, all are IDEAL occasions to offer someone you hold dear to your heart a wonderful gift. If you have any questions about this product by AmyHomie, contact us by completing and submitting the form below. If you are looking for a specif part number, please include it with your message.